Down with populism! So goes the Remainers’ mantra. 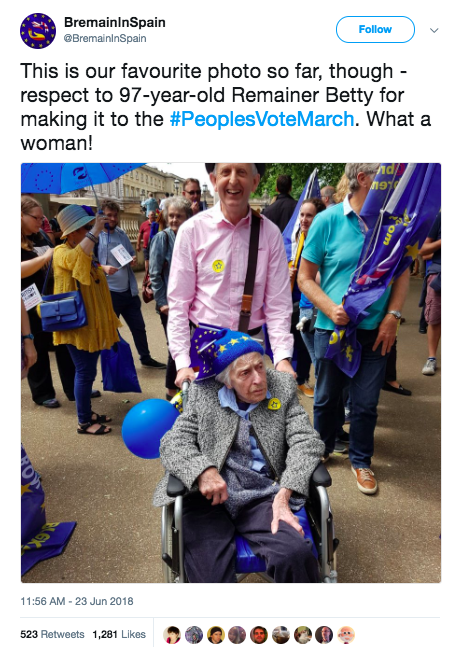 And then James McGrory from a group called Open Britain, tells the BBC as she marchers through London with “thousands” of others holding EU flags:”…the most important thing is that this isn’t decided just by 650 politicians in Westminster… Brexit is such a big deal [that] it should include all 65 million of us in the country, and that’s why people today are marching for a people’s vote.” If ‘the people’ don’t like what the Government – the one they voted for – has agreed with the EU, they can reject the deal and reverse Brexit, which ‘the people’ also voted for. A people’s vote is not to be confused with a referendum. A referendum is when politicians say the people must decide: winner takes all. A peoples’s vote is when politicians who lost the first vote side with the people who also lost and demand that in the spirt of fairness everyone votes again. This can continue until the ‘right’ result is delivered. By way of further explanation, People’s Vote, who organised today’s anti-Brexit march in London, say Brexit is “not a done deal” and people must “make their voices heard”. Making your voice heard might be called ‘voting’ in a ‘democracy’. Anyone over 18 can be heard this way. Voting ensures that everyone gets an equal say, no matter how rich or powerful they are. Addressing the demonstrators was Liberal Democrat leader Sir Vince Cable, who told them: “Brexit is not a done deal. Brexit is not inevitable. Brexit can be reversed.” If you want to vote against Brexit you can vote for the LibDems. Green Party co-leader Caroline Lucas told the crowd: “I believe Brexit will be a disaster for this country. It will make all of us poorer in so many ways.” Vote Lucas and the Greens to stop Brexit. Although a word of caution: what one person “believes” may not be the best reason to vote for them. Her belief is as valid as your belief and the belief of the woman next door. One person, one vote. All voices are equal. The government is giving Parliament a vote on the final deal, if one is reached, in the autumn – but it remains unclear what will happen if they reject it. Nothing should happen. The deal will be done. And then successive governments can temper it and renegotiate parts of it. They can campaign on certain elements of the UK’s relationship with the EU and see if the electorate backs them at the ballot box. “Cameron.” Bit adult that phrase, no, like something a dad or mum night say. Mr Cable went on to say that the young want to stop Brexit. The young are right and should win the day, goes the message. The old are wrong and wtheir will should be ignored. “Caroline Lucas, Vince Cable and David Lammy [Lab] were among speakers that … accused the older generation of betraying Britain’s young people,” says the Guardian. The old defy the young!